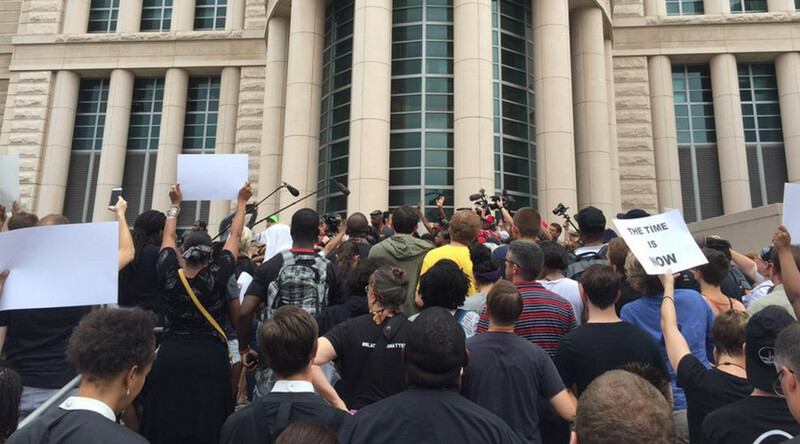 As St. Louis County declared a state of emergency, about 50 protesters, including prominent activist Cornel West, were arrested in front of the federal courthouse, at a rally organized on the anniversary of Michael Brown's death. The 'Day of civil disobedience' march started at Christ Church Episcopal Cathedral in St. Louis and ended at the Thomas F. Eagleton federal courthouse, where dozens formed a living chain. They were chanting 'No justice, no peace', and 'The people united shall never be defeated,' while standing in line in front of the police line for around an hour. Also arrested were Black Lives Matter activists Deray McKesson and Johnetta Elzie, who were filming the protests. Thousands gathered in Ferguson, a suburb of St. Louis, over the weekend to mark the anniversary of the fatal shooting that claimed the life of Michael Brown. Brown, 18, was shot multiple times by Ferguson PD officer Darren Wilson on August 9, 2014. “The recent acts of violence will not be tolerated in a community that has worked so tirelessly over the last year to rebuild and become stronger,” said the order, issued by county executive Steve Stenger. The decision comes after a night of unrest in Ferguson punctuated by gunfire and break-ins. Police have shot one man, identified as 18-year-old Tyrone Harris Jr. of St. Louis. Citing his family, local media reported that Harris was “real close” to the late Brown. Harris was seriously injured, but was alive and undergoing surgery as of Monday morning.